This article describes the steps to edit the settings of a previously defined work center group. 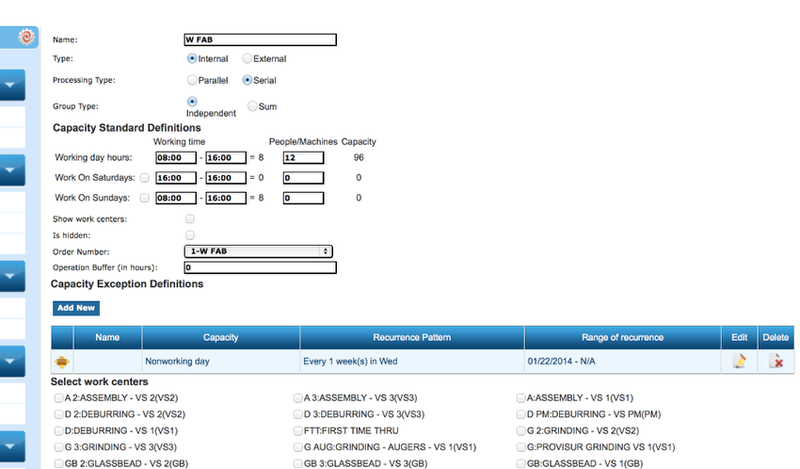 Create the group by following the description in the "Work Center Group Data Maintenance Screen Opens" step below. In this screen you may edit the following information. When creating a new work center you will enter the information from scratch. The Type: Is it an internal or external operation. Processing Type: Is it a parallel process where more than operator or machine in the work center works on the item at one time or serial where each work center processes the items in sequence. Group Type: An Independent Group is a group of machines that together form a different capacity versus a Sum which is the sum of the capacities of all the work centers. Capacity Standard Definition: The work centers capacity definition. If sum is chosen, none of these values apply and the options are hidden. 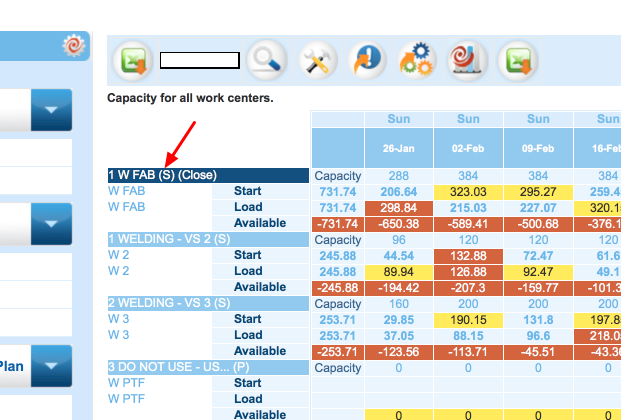 Show Work Centers: The option to show or hide the individual work centers from the group view. Is Hidden: The option to hide the work center in the capacity view. Order Number: Where to place the work center in the list of work centers. Operation Buffer: Adding a buffer time between each work order processed through the work center. Capacity Exeception Definitons: Adding exceptions to the standard capacity definition. This could be non-working days or days where hours are increased or decreased. Select Work Centers: The selection of work centers that make up the work center group.